PLUCK (USA) (Bay 2008-Stud 2012). 3 wins at 2, Breeders' Cup Juvenile Turf S., Gr.2. Sire of 129 rnrs, 62 wnrs, inc. SW Aspect (VRC Maribyrnong P., Gr.3), Life on the Wire, Mongolian Wolf, SP Gasoline - Jade Theatre (H.K. ), Plucky Girl, Lady Pluck, Lucky Louie and of Cogliere, Star Boy, All Pluck, Beyond Brave, Creidne, Harlem Child, Our Moon, Pluck That - Winwin Ruby (H.K. ), Pluckit, Awesome Pluck, Classy Anna, Ready for Love, Sess, etc. Lady Pluck (f. by Pluck). Placed. See below. Dee You See Kay (f. by Pluck). 2 wins-1 at 2-at 1000m to 2017-18 in Aust. The Deestructor. 3 wins at 1400m, BRC Walker Technical Consultants H.
Deelites. 2 wins. See above. Akacheeta. 2 wins at 1200m in Aust. Sire. Galaxy Jak. Winner at 1500m in 2017-18 in Aust. ZARIZ (Mukaddamah). 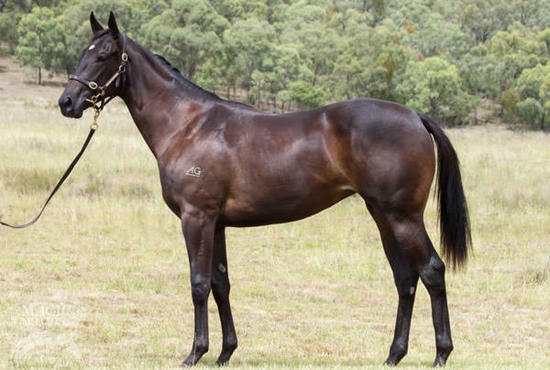 7 wins-3 at 2-to 1350m, A$450,720, AJC San Domenico S., Gr.2, Up & Coming S., Gr.2, BTC Sprint H., Gr.3, STC Heritage S., L, BTC Winter Garden 2YO H., Treasury Casino 2YO H., QTC Mistletoe 2YO H., 2d BTC Courier-Mail Classic S., Gr.3, 3d NSW Tatt's RC Roman Consul S., Gr.3, Qld Tatt's RC Mercedes-Benz S., Gr.3, City Tatt's RC Lightning H., BTC Brisbane Marriott Hotel Freshman 2YO H. Sire. ELECTRIFYING - FLYING FLYING (H.K.) (Success Express). 4 wins-3 at 2-to 1200m, A$238,635, HK$1,321,485, BTC Coca-Cola Classic, Gr.3, Crown Lager 2YO H., HKJC Lam Tin H, 2d AJC Canonbury S., L, HKJC Tea For You H., Chinese Club H., 3d AJC Kindergarten S., Gr.3, BTC Doomben Slipper S., L, VATC Melbourne FC H., HKJC Martell Extra H., 4th MVRC CS Hayes S., Gr.3, Gosford Slipper, L.
Dashing Express. 13 wins to 1400m, AJC Paddock H., 2d STC Sleigh Bells 2YO H., AJC FC Griffiths 2YO H., Will H Ogilvie 2YO H., 3d AJC Exchange H., STC Hunting Horn 2YO H.
Rite to Success. 5 wins to 1400m, BTC Excel Exhibitions H.
Amajill. 6 wins-1 at 2-to 1400m, A$114,830, to 2017-18 in Aust. Braveheart. 2 wins at 1050m, 1100m, 4th AJC Canonbury S., L.
Bancomat. Winner at 1000m in Aust. Zabinski. Winner at 1600m in Aust. Pick Up Line (Snippets). 8 wins-3 at 2-at 1000m, 1200m, A$203,025, MVRC Brent Thomson H., WATC Edwards & Chaffey H., San Toy H., VATC Belhaven H., Veneda H., WATC Doug Gilmour 2YO H., Thorium H., 2d WATC Crystal Slipper S., L, MVRC Strathayr H., Emirates WSRC H., WATC Pantheist 2YO H., 3d WATC NJ Way S., L.
AVON BRAE (Coup de Feu). 11 wins from 1200m to 2100m, A$76,005, SAJC Tattersall's Cup, L, Twin City H.
Race Record: 1 Starts 0-1-0 A$20,250. Placed at 2 in 2017-18, 2d TTC Gold Sovereign S., L.